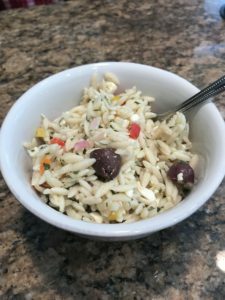 With Labor Day barbecues in full swing this weekend (barring the weather, of course), here's a simple dish you can make in advance and that travels well and feeds a crowd. Cook orzo per package direction. Meanwhile, in a very large bowl, add vinegar, olive oil, and salt and pepper. Whisk together to combine. Season as needed. Drain and rinse orzo. Add to bowl. Then add the veggies and toss. Add olives and toss. If refrigerating, or serving right away, add feta. If not, add before serving. Toss to combine and check for seasoning.